The Curiosity Rover, also called the Mars Science Laboratory (MSL), landed successfully in Mars at the Gale Crater. It was reported to have landed in the crater near the planet's equator at 05:32 GMT. Curiosity was designed to steer itself during the descent into Mars and through its atmosphere mimicking maneuvers done by NASA space shuttle astronauts called S-curve maneuvers. A parachute, retro rocket and a "sky crane" then helps put Curiosity on the ground. The upper stage of the space craft acts as the sky crane lowering the upright rover on a tether to the surface. The target site for Curiosity's landing is The Gale Crater. The Gale Crater is a depression made by an asteroid or comet billions of years ago. From the crater floor rises a huge mound of rock rising 5km. The mound of rock, named Mount Sharp, is believed to be made up of ancient sediments; some deposited when Mars still had abundant water at its surface. The mission of MSL is to study whether the Gale Crater contains evidence of past and present habitable environments. This primary mission will last one Mars year (98 weeks). The rover Curiosity is similar to previous Mars rovers Spirit and Opportunity. It inherited design elements such as the six-wheel drive, the rocker-bogie suspension system, and thecameras mounted on the mast to help the mission’s team on Earth select exploration targets and driving routes. Curiosity is twice as long and five times as heavy as the other rovers and also carries equipment to gather samples of rocks and soil, process them and distribute them to onboard test chambers inside analytical instruments. It is the largest and most advanced rover ever sent to the planet Mars. It has 10 science instruments to use to search for evidence of environment favorable for microbial life. It is equipped with a laser to look inside rocks and release their gasses for the onboard spectrometer to analyze and send the data back to Earth. 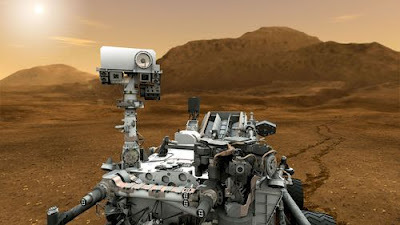 The Curiosity rover has multiple cameras and instruments, including Goddard's Sample Analysis at Mars (SAM) instrument suite. SAM will help the rover discover whether Mars ever had the potential to carry life by analyzing the Martian soil and environment for evidence of water, carbon, and other life building materials.